Good quality chicken is often sold as whole chickens. I take off the legs and breast, and use the rest to make stock. 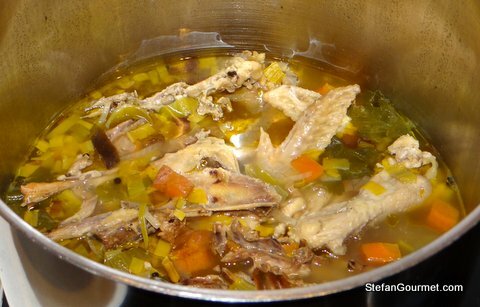 When making stock from bones, chefs differentiate between ‘white’ stock and ‘brown’ stock. The difference is that white stock is made from raw or blanched bones, whereas for brown stock the bones are roasted first. Brown stock has a more rich, fuller flavor than white stock. 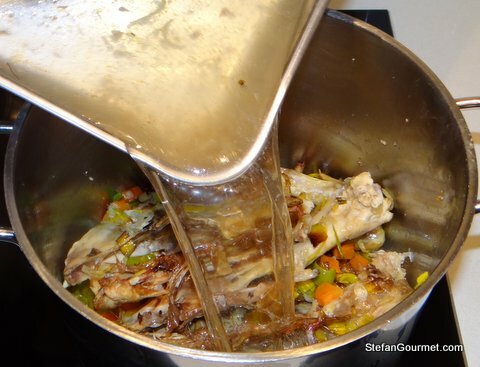 For the best Coq au Vin sauce, it is best to use a brown stock. 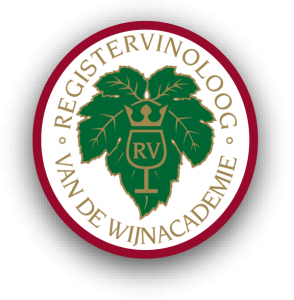 Since I posted about Coq au Vin the other day, I thought I’d share a recipe for brown chicken stock with you. Please note that I did not include salt in the recipe because it is never a good idea to add salt to stock before you know what you are going to do with it. 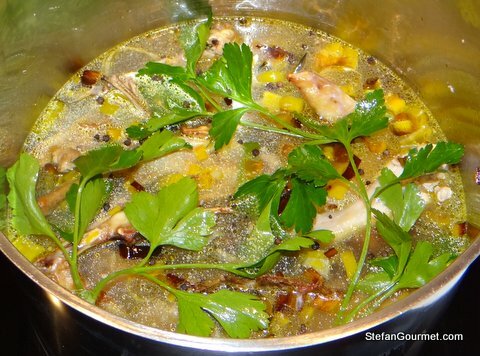 You may have to simmer the stock down to make a sauce, and then it may end up too salty. Preheat the oven to 190C/375F. 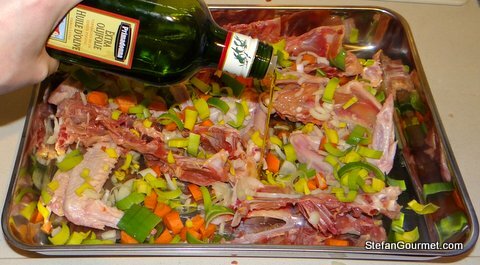 Put the chicken carcass (hacked into pieces if needed) into a large oven dish together with the vegetables. 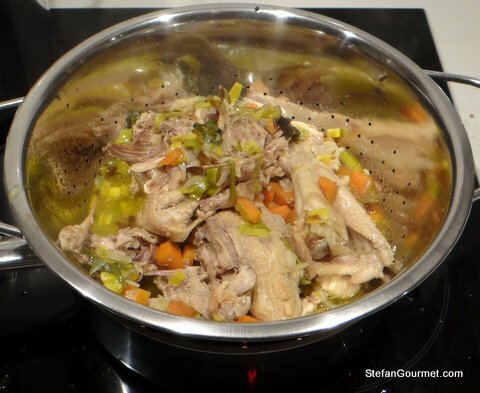 Drizzle with olive oil and toss to coat the bones and vegetables with olive oil. The coat of oil will help the browning process. Roast in the oven for about 45 minutes or until golden brown. 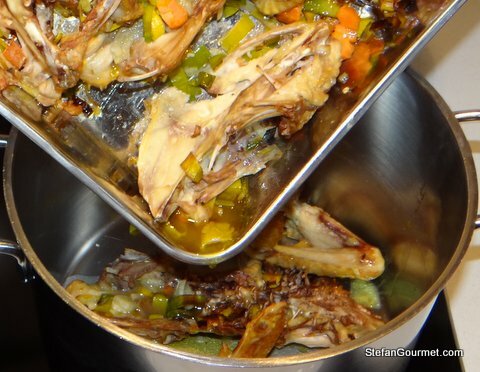 Transfer the contents of the oven dish to a stock pot, including the juices. Deglaze the oven dish with water. 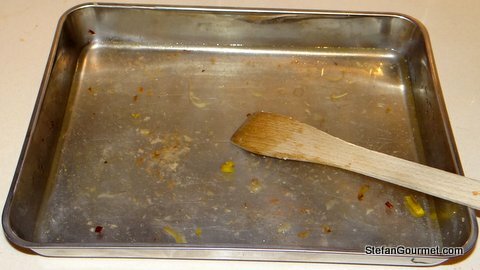 Scrape the bottom of the oven dish with a spatula to get all the flavor in. Add the water from the oven dish to the stock pot. Add more water until you have added about 1 liter (1 quart). Add a bit more if needed to cover the bones and vegetables. Add parsley and pepper corns. Bring to a boil, lower the heat to a simmer and simmer for about 3 hours. It probably won’t be necessary to skim, since there usually isn’t a whole lot of scum when using roasted bones. 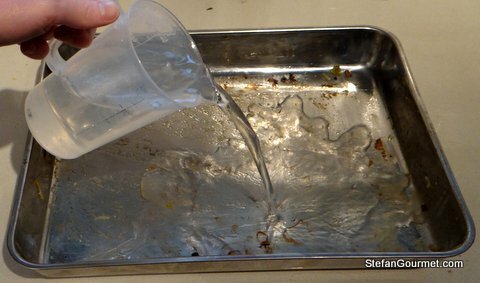 After three hours, filter out the big solids using a colander. 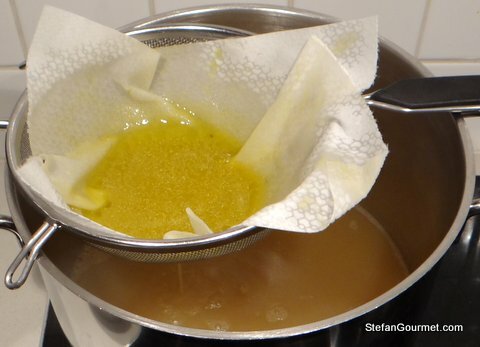 Finally sieve the stock with a cheese cloth or kitchen paper. The stock will keep for a few days in the refrigerator or for months in the freezer. Freeze in an ice cube tray to make it easier to use just how much you need. Love the post, Stefan. If you have sound fundamentals any dish you prepare will impress. It’s always fun looking at different approaches and techniques to make a dish or base. I used to use carrots in my chicken stock but one day decided I didn’t like the distinct color the carrots gave to the stock. So, I stopped and never noticed a significant difference in flavor. I also like to use the bones from roasted whole chickens that we eat for dinner or for which I have other uses for the meat. Have you ever added beaten eggs or egg whites to form a raft and help clarify the stock? It’s a trick I learned almost 40 years ago and works very well. I can easily build a consommé off most of my stocks. BTW-I sent you a message on Facebook. Carrots make it taste sweeter, and they are part of the holy Italian trinity of carrots, celery, and onion (although I didn’t use celery here). I mostly use stocks for sauces and so don’t need to clear them. I know about the method to use egg whites, I just haven’t needed it yet. I suppose it’s about time I do a consommé. Thanks for point out your msg on FB — I don’t often check the “other” category. “I mostly use stocks for sauces and so don’t need to clear them.” Ah, but IMHO, even with a sauce, there is a difference in “palatability,” i.e. mouthfeel. You might want to try it to see if there is a difference. Thanks Richard, that’s very interesting! This is the first time hearing about this, after having been slightly confused about why so much fuss is made to keep stocks clear when they are ending up in a sauce anyway. I feel a side by side experiment coming up! I really appreciate that you share your experience with me. I learn a lot, get ideas for new delicious recipes, and have lots to write about. Your point about salt is well-taken. But I always add some salt to the bones and vegetables as I just think it enhances flavor development (being careful not to overdo it). But I never cook with salted butter. And, I know my stock always contains some salt and I compensate for it later when I am cooking with it. Hi Bob, thanks for your comment. Do you have a theory why salt would help with the flavor development? I would be interested to know it. Never thought about roasting some of the veg as well. What a great idea. It adds an additional layer of flavor. I’m so glad for the step-by-step! I have heard of roasting the bones, but never knew how it all came together. This is excellent. I also really like the idea of freezing it in the ice cube trays. Adding in the roasted vegetables sounds like such a natural melding! thx to you i never wasted my bucks on ayam brand superior stock anymore…. Nice post, and nice blog. I’m pretty impressed, haven;t found an interesting food blog in a while. I was taught to just roast the bones, and put in the veg for a meat stock very chunky (as in break carrots and celery in half, no more). The thought was that as you cook meat stocks a long time you don;t want the veg to break down too much, as the little bits it creates take up flavour that could be in the broth. Nage (veg stock) used small dice vegetables, but you only cooked it for 45 mins. Also, i tend to collect washed leek tops in a bag in the freezer to add to stock. They do colour it a little darker but I like the flavour a lot. Still, I do the same as you in buying whole chickens to make stock. Int he Uk for most qualities of chicken the whole chicken is barely more than two breasts, and if you have a decent boning knife it hardly takes much time. Thanks for visiting and leaving such a nice compliment and thoughtful comments. I know that it is better to add the vegetables only for the last hour to avoid overcooking them, but I like the roasted vegetables and it is easier like this. I should probably do a side-by-side comparison to find out whether it is worth the additional trouble. I collect leek tops as well, but prefer to use them for stronger stock like beef. I have a decent boning knife, but still need some more practice to be able to bone a chicken quickly. You’re welcome in regards the comments on the blog, i found it as i was given a sous vide machine and was looking for recipes. I found yours and was impressed. Still getting to grips with it myself but making some progress. I think you were the top hit for ‘bream sous vide” :). I made a ‘sauce’ from a few fresh mussels and prawns, white wine and tarragon and it came out well. I’d be interested in the side by side on the stock issue. Like I said as it was explained to me by my chef back when I was a youngun and playing around in kitchens, you wanted to avoid a precipitiate/scum in stock as much as possible as it not only made it less clear but the bits absorbed flavour, but this might be the kind of thing that is a fractional difference. I think I read similar from Thomas Keller in his French Laundry book, but don’t have it to hand now, but gain at his level it may be a small difference he is going for. Boning a chicken is just practice I guess, no idea how ‘correctly’ I do it but I can certainly get the legs and and breasts off pretty fast. The slow bit is if i want to debone the legs (I like them whole but my better half only likes clean connective-tissue free meat). Anyway, thanks again for the very nice site. You’re welcome and I’m looking forward to seeing you around more often! I’m certainly going to do more sous-vide recipes and would be happy to try to answer any questions you may have on the subject. I’ve been cooking sous-vide on a regular basis for almost two years now and have tried many things (also before I started blogging). I am currently experimenting with horse meat sous-vide, and had the first fail in a long time. Horse sirloin was still tough after 24 hours at 55C/131F, although it was ‘overcooked’ in the way that only sous-vide meat can be at the same time. Think I’m going to try 12 hours at 60C/140F next. Such a great instructional post, Stefan. Though I enjoy a clear broth for some soups, a brown stock works best as an additive for other dishes. It’s flavor is so much more complex. And we are in total agreement about salting the stock.